I know what you're thinking but just trust me on this one. I've never been shy about my love affair with beets. Beet latkes, borscht, beet juice, raw beets...okay, I'll stop. 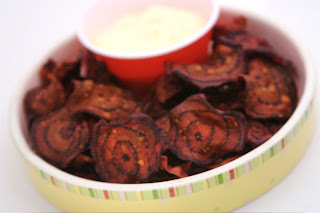 I'm always looking for new ways to cook with beets so you can imagine my delight when I came across a recipe for beet chips. I totally understand if you just cringed. I've been witness to more than a few recipes where the author tries to convince you that a take on something healthy is actually good, when really you never imagined that it could be possible. These beet chips and horseradish dip from Tofu For Two will restore your faith in that which is healthy. Don't get me wrong, I think regular chips and dip are some of the best things on earth. However, I am here to promise you that even if you are not a die hard beet fan, you'll probably still like, no love these beet chips. Peel the beets and slice them very thinly with a cheese-cutter. Cover a baking sheet with parchment paper and spray a thin layer of olive oil over the paper - you can also brush the paper with a little oil as well. Arrange the beet slices on the baking sheet, snugly but not overlapping. Spray them with some more olive oil. Bake them in a preheated oven at 100 degrees Celsius for 35 minutes, flip the chips and bake for 40 minutes more. Check on them every 10 minutes or so just to make sure they aren't charring. After baking, salt the chips and let them cool on a rack for 15 minutes before digging in. Mix all the ingredients and refrigerate the dip while the chips are in the oven. Sprinkle with the chives right before serving. Love beets and this looks so interesting. I have to try them. Aren't these something! I love savory beets, but not keen on sweet ones. These are perfect! I just LOVE the name of you blog, so clever! If I'm not mistaken, I think I just saw your beet chips on Tastespotting. Well done, they look delicious. They are so pretty once you bake them. And they are so delicious. Let me know if you try them. Thanks for stopping by. You have such a great blog, I love it. Thanks for visiting mine. I think you'll really like the horseradish dip with these given that you like savory. Can you bring those to my next party! I would eat them all! Just name the time and the place. I'll gladly bring these chips considering you'll most likely be bringing the cupcakes!?! YAY! Oh my Olga, I'll be trying out your mashed potato recipe for sure. I love the idea of beets and horseradish, sounds awesome!